Are you thinking about installing a salt water chlorine generator? Are you confused about all the different points of view? Are you unsure about whether it is safe? There is a big debate going on and many different views when you look at all the different saltwater chlorine generator reviews. The same debate goes on about the more common chlorinated pools. But as with all things, each has their pros and their cons attached. To make matters easier for you, we have looked at, and discussed, all the pros and cons when it comes to the best salt water chlorinator around. 1 How Do Salt Water Pools Work? All the best salt water chlorinators work in a similar way to keep your pool not only clean but sanitized as well. They all produce chlorine from table salt in a safe, automatic, and effective way. This means that chlorine generates from table salt, which is relatively cheap, and you no longer need to buy or handle harsh chlorine products. Nor do you have to store this hazardous material. So essentially, a saltwater pool is also a chlorine pool, but one with benefits. But how does chlorine become salt? Well, once the generator is installed, you add the salt into the pool. This salt cell has electrical plates. Once the power is on, an electrical charge is sent to the electric plates and the salt water, when running over this plate, is then turned into chlorine, which is pumped back into your pool. The beauty of this system, however, is that you no longer need to handle or store chlorine while the actual chlorine content in your pool is much lower than that of normal, conventional chlorine pools. According to many chlorine generator reviews, all the best salt water chlorinators have many more advantages when it comes to conventional chlorinated pools that disadvantages. But what exactly are the advantages of salt water generators and what are their disadvantages? Installing a chlorine salt water generator means you need to spend less time looking after your pool. You can even go on vacation for a few weeks without worrying about coming home to a green pool that is full of algae. The best salt water pool chlorine generators monitor your pool automatically, increasing or decreasing their chlorine production automatically. Installing a salt water pool chlorine generator means that you no longer have to add chlorine to your pool. It happens automatically as needed. This means that only the necessary chlorine is made from salt to keep your pool healthy and clean. The name ‘salt water pool chlorine generator’ is actually a little misleading. This is because chlorine is made from natural salt. Therefore, the amount of actual salt in the pool is very little – about the same amount, you would find in human tears. This small amount of salt does not sting the eyes, and is quite beneficial – it keeps your skin soft and smooth without any negative effects. The chlorine levels in a pool with a chlorine generator very low. This means that you no longer have to deal with the harsh treatment of a normal chlorine pool that damages your skin and dries out your hair. A pool with a salt water chlorine generators also great for people who have sensitive skin or allergies. Because the water is so gentle, they usually have no problems swimming in this type of pool. A saltwater pool had much less maintenance that a chlorine pool, but the electricity usage is slightly higher. So, be prepared for an increase in your electricity bill. It is much more expensive to install a salt water chlorine generator system than a system for a normal chlorine swimming pool. You do, however, save money in the end because you no longer need to buy expensive chlorine. Salt is a corrosive agent and can cause damage to your pool parts, accessories, pool liner, surrounding masonry work, and even your underwater lighting system. This is because salt is always present, even though in very small quantities. Of course, this kind of damage would take a very long time before you actually notice it. Salt has a disadvantage as far as plants go. It not only kills them but dissolves some of the nutrients in the soil needed by plants to grow. Certain areas do not allow salt water swimming pool generators, so make sure whether you may to do so in your area before installing one. We have done the legwork for you and reviewed a number of chlorinators so that you can decide which is the best salt water chlorinator for you! Here follows a list of what we consider the best salt water generators for in-ground pools. An easy to instore generator, the Pentair 52055 has displays that are easy to view for when you need to check on the salt levels, water flow, sanitizer output and cleanliness of the cell. It includes all performance data, including operating hours, chlorine output, salt levels, etc. This is one of the most popular chlorinators around and claimed to cut your chlorine costs by fifty percent. The displays are easily accessible to view salt levels, water flow, cleanliness, etc. The performance data settings include the hours of operation, cleaning cycles, salt content, and chlorine output. 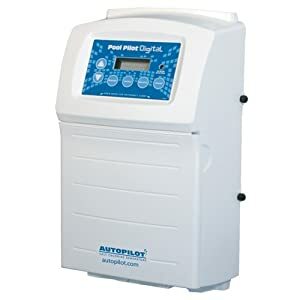 The Autopilot Digital Chlorine Generator Salt Water System is one of the easiest to operate chlorinator systems around. The system features a digital read-out that indicates your salt level, purifier production level, and the temperature of your pool’s water. 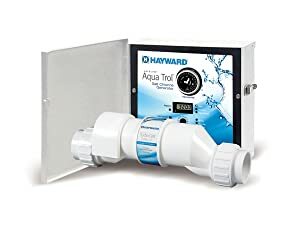 The user-friendly, cost effective Hayward Goldline PL-Plus Prologic system is suitable for pools up to 40,000 gallons. It automatically senses pH and other levels and dispenses a self-renewing supply of chlorine as and when needed. This system is relatively simple to install, has no leaks, almost eliminating the need for additional chemicals. This unit is highly recommended because replacement parts are easily available while the element life is between three and five years. This salt water chlorine generator is great for pools up to 3500 gallons. Are you looking for the best salt water generator for your above ground pool? We have done a few reviews on the best out there. The system is only suitable for above ground pools. The automatic shut-off feature prolongs the unit’s life and protects it when water temperatures are low. The on-time cycling feature ensures no calcium and scale build up. You have a longer cell life due to isolated control electronics that are away from all heat components. This system combines two-stage technology. The first stage has natural salt added to water to produce chlorine before passing through the titanium electrolyte cell. The second stage has to do with the electrocatalytic oxidation process where the water molecules split into oxidants. These oxidants destroy the bacteria and algae that might be present in your water. The Solaxx CLG10A Saltron Retro Self Cleaning Salt Chlorine Generator is fully automatic with the added bonuses of being economical and easy to install. 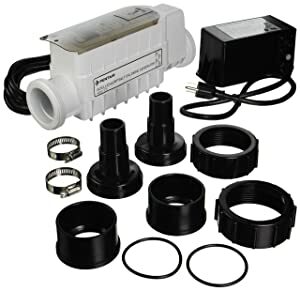 The adaptor, which is included, allows for use in in-ground pools as well. Were you aware that you get chlorine generators for spas? What follows are a few salt water generator reviews for spas and hot tubs. This unit produces up to 30 grams of chlorine per day and has ten chlorine production levels suitable for a spa of up to 1000 gallons. Included in the system are salt level indicator lights. You can thus boost your chlorine production as and when needed. The easy to operate, drop-in spa system is extremely easy to operate. Your chlorine output adjusts by means of the timer on your power supply unit. The programmable digital timer adjusts your chlorine output. Its electricity usage is minimal. There is no negative feedback on this one! There is no doubt about it! Maintaining a saltwater pool is much easier than maintaining a traditional chlorine one. But this does not mean that there is no maintenance whatsoever! Any pool needs maintenance, even a saltwater pool that has the best salt water pool chlorine generator on the market. But just what maintenance do you need when you have a saltwater pool? Maintenance is easily divided into different phases, as you do not need to do everything each time you check up on your pool! Summer needs more maintenance than winter. For phase one we assume that you have read salt water generator reviews and that your machine is installed and the water healthy. Now all you need is to maintain it. Phase one is about weekly maintenance. The best salt water chlorinators work best when the salt concentrations are within the specifications given by the manufacturers. It is different from one chlorinator to the next. It is best to make sure you follow the manufacturer’s guidelines. If you do not, you are at risk of causing damage to your salt cell due to calcium buildup. Having a proper pH allows the chlorine to remove germs and bacteria from your pool. You might need to add some acid at times because salt water pools have a habit of building up their pH levels over a period of time. improper pool circulation or a salt cell needing replacement. If your pool’s chemistry is wrong, make sure to take the necessary measures to correct it as per the chlorine generator manufacturer’s recommendations. Remember, each chlorine generator is different, and each manufacturer’s recommendations are different. So make sure of this so that your machine of choice works according to its optimal specifications. Where alkalinity is low, corrosion, staining or algae can occur. Where it is too high, the pool becomes cloudy. Stabilizer stops the chlorine in a salt water pool being lost because of the sun’s UV rays. If your pool does not have enough stabilizer in it, you can lose up to around 90 percent of your pool’s chlorine on a sunny day. A salt water pool needs more stabilizer than a normal chlorine pool. The dissolved solids in a salt water pool are more than that of a regular pool. This is because the salt in a salt water pool is picked up as a dissolved solid. If the total dissolved solids are more than 1500 ppm than your salinity (salt content), it means you have to backwash and clean your pool’s filters more often. When the total dissolved solids are more than 1500 ppm it reduces your chlorine and other chemicals’ effectiveness. It also results in the water becoming cloudy. 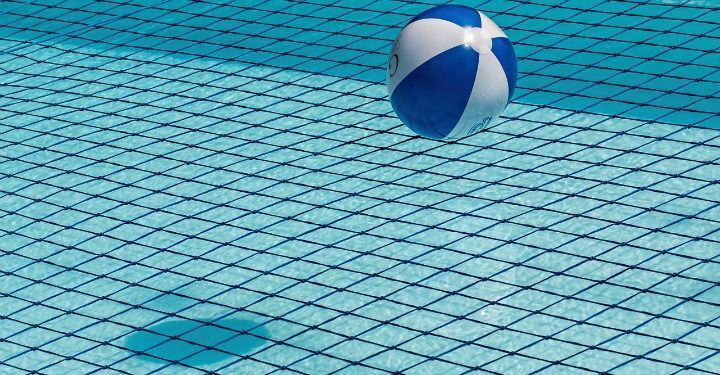 Iron, copper, and manganese: You need to check that these metals are not present in your pool’s water. Phase three covers the pool maintenance needed once a year. It usually needs doing at the beginning of summer so that your summer swimming experience is great! You need to clean your salt cell once a year. 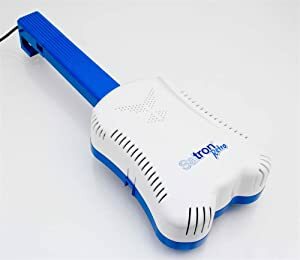 This makes sure you have no buildup of calcium that can cause your salt water pool chlorine generator to stop making enough chlorine from salt. A salt cell only lasts between four and six years before you need to replace it with a new one. You also need to inspect it about every three months during summer to make sure it stays clean and free from calcium buildup. Although you need to check whether there is enough salt in your salt water chlorine generator at the begging of the summer swimming season, you may also need to top it up during the summer. 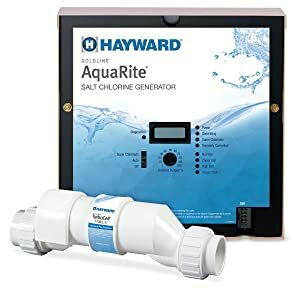 Most of the best salt water pool chlorine generators show you the salt readings automatically so that you know at a glance how much salt is still available. Not all saltwater chlorinators are the same. Some are, indeed better than others. At the same time, what is suitable for my pool, may not be suitable for your pool. Pools are different. Some are above the ground, some are in the ground, and made out of different materials. So, the question is what is the best salt water chlorine generator for my pool? To answer that question, you need to consider the following. This will allow you to make an informed decision as to what to look out for when deciding on the best salt water chlorinator for your specific needs. This is very important. You may need either a chlorinator for an in-ground pool or one for an above ground pool. Some types of chlorinators’designs are fit for both types of pools. Others, however, are designed for either one or the either. How big is my pool? You need to know how much water your pool holds. This helps you to decide on the best saltwater chlorinator for your size pool. A large pool needs to have more chlorine than a small, splash pool, for example. 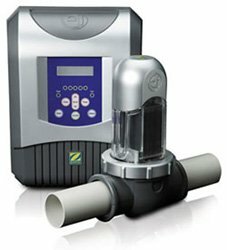 Do I want a good brand of saltwater chlorinator? As mentioned before, some pool chlorinators are better than others. They are also, usually, a little more expensive, but their parts are more easily available. Do I want an extensive warranty? 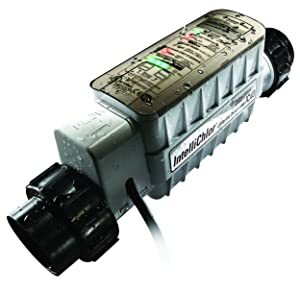 Most brands of swimming pool chlorinators come with a warranty. Some, however, offer a more extensive warranty than others do. What are their additional features? When you look at the different brands of chlorine generators, take note of any additional features they have. Are all parts included, or do you have to buy them separately? Does it fit in with my pool’s plumbing? 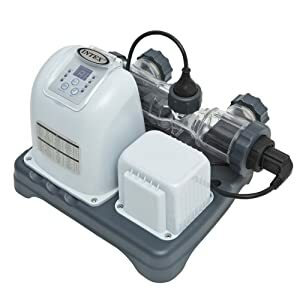 If you do not want to redo your pool pump’s plumbing, you may need to make sure that the chlorine generator you choose fits your existing plumbing. Do I need an online, or an offline, chlorinator? 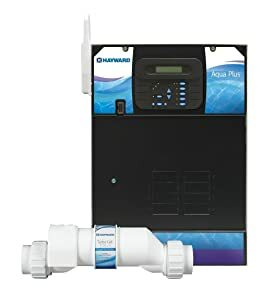 Do you have enough space to put your chlorinator in line with the rest of your existing pool equipment, or will you have to connect it by means of a bypass line for the plumbing? After reading these questions and answering them, you now know what to take into consideration when deciding on the best salt water chlorinator for your pool. Just to make sure, make a checklist and ask yourself whether the one you have chosen ticks all the boxes and that you do not need to buy any extra parts to install it. It is a system where salt turns into chlorine by means of a salt water chlorine generator instead of using traditional chlorine. The salt in the chlorine generator turns into chlorine when a low-level electrical current passes between special metal plates in the machine. Is a salt water pool free of chlorine? No, it is not free of chlorine. The salt turns into chlorine by the salt water chlorine generator. The amount of chlorine, however, is much less and much more gentle on the eyes and skin. Does the salt in the water control algae? The salt in the water does not kill algae. It also does not sanitize your pool. 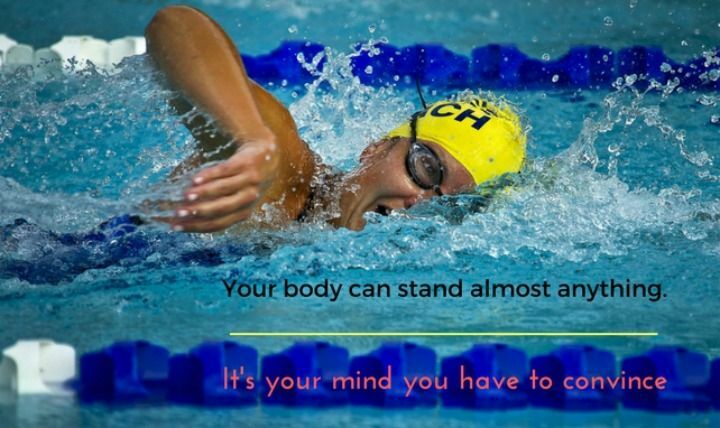 It is the chlorine that does so. Won’t the salt in the water hurt my eyes or damage my skin? No, not at all! The amount of salt in the water is only about ten percent of the salt you find in the ocean. It will not hurt your eyes at all! An added bonus is that the low salt percentage will also keep your skin nice and soft. How much salt will my pool need? The amount of salt your pool needs depends on two things: the size of your pool, and the type of chlorine generator you want to install. You should always follow the manufacturer’s recommendations. I have an indoor pool. Does it use the same amount of salt as an outdoor pool? No, it does not, and here is why! An outdoor pool loses over eighty percent of its chlorine due to the sun’s UV rays. So an indoor pool, therefore, loses less chlorine and therefore uses less salt. Most modern salt water chlorinators have you add the salt directly to the pool water. Do I need a special kind of salt? No, not really. Just so long as it is salt that is not iodized. No, salt is much cheaper than chlorine. Will the salt damage my pool’s vinyl lining? No, it will not. Damage to vinyl linings is due to the sun’s UV rays. Will the salt damage my existing pool equipment? This depends on the type of equipment. Older equipment contains metal. Salt will cause corrosion if this is the case. Newer pool systems are made mostly of plastic so it should not cause damage. Will the salt damage my stonework and concrete around the pool? Salt does cause damage, but because the salt levels are so low, the chances of damage occurring are minimal. 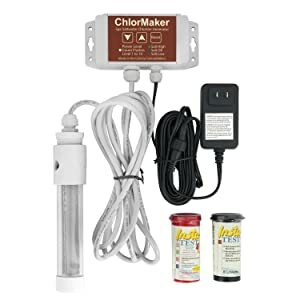 Will I still need to add stabilizer to my pool if I install a chlorinator? Yes, you will! Remember, the salt turns into chlorine; therefore, you still need to add other pool chemicals. Yes, it will, but not by very much. Will I save money if I install a salt chlorinator? Compared to a pool operating using store-bought chemicals, etc. the answer is yes. You have long-term savings because you no longer have to buy chlorine, which is expensive. Although many people are still debating the pros and the cons of saltwater pools versus the traditional chlorine pools, we cannot get away from some undeniable facts. Saltwater chlorine generator reviews have a few things right. From a safety standpoint, they are better, simply because they cause no eye or skin irritations, unlike most chlorine pools, and they do save you money in the long term. This is because you drastically cut down on your use of chlorine. Although your electricity costs may be slightly higher, the newest generation chlorinators are designed in such a way that you probably won’t see your monthly bill go up by much. We hope you have found the information useful. Please do contact us for any assistance, whether it is for purchasing one of the best saltwater pool chlorine generators around, or for some sound advice.